Author contributions: All the authors contributed equally to this work. Pancreatic cancer is the fourth leading cause of cancer death in the United States. While surgical resection remains the only curative option, more than 80% of patients present with unresectable disease. Unfortunately, even among those who undergo resection, the reported median survival is 15-23 mo, with a 5-year survival of approximately 20%. Disappointingly, over the past several decades, despite improvements in diagnostic imaging, surgical technique and chemotherapeutic options, only modest improvements in survival have been realized. Nevertheless, it remains clear that surgical resection is a prerequisite for achieving long-term survival and cure. There is now emerging consensus that a subgroup of patients, previously considered poor candidates for resection because of the relationship of their primary tumor to surrounding vasculature, may benefit from resection, particularly when preceded by neoadjuvant therapy. This stage of disease, termed borderline resectable pancreatic cancer, has become of increasing interest and is now the focus of a multi-institutional clinical trial. Here we outline the history, progress, current treatment recommendations, and future directions for research in borderline resectable pancreatic cancer. Core tip: Borderline resectable pancreatic cancer has become recognized as a clinical entity worthy of study based on a number of clinical observations that recognize a continuum between resectable and locally advanced unresectable disease. There are few prospective trials and therefore no data to support specific treatment regimens in borderline resectable pancreatic ductal adenocarcinoma (PDAC). Difficulties in achieving a consensus, objective definition, small numbers of patients and variability in therapeutic algorithms have delayed progress in establishing strong evidence-based practices for diagnosis and treatment. The Alliance trial represents a first step in establishing reproducible standards by which future trials in borderline resectable PDAC can abide. Pancreatic cancer is the fourth leading cause of cancer death in the United States. While surgical resection remains the only curative option, more than 80% of patients present with unresectable disease[1,2]. Unfortunately, even among those who undergo resection, the reported median survival is 15-23 mo, with a 5-year survival of approximately 20%[3-5]. Disappointingly, over the past several decades, despite improvements in diagnostic imaging, surgical technique and chemotherapeutic options, only modest improvements in survival have been realized. Nevertheless, it remains clear that surgical resection is a prerequisite for achieving long-term survival and cure. There is now emerging consensus that a subgroup of patients, previously considered poor candidates for resection because of the relationship of their primary tumor to surrounding vasculature, may benefit from resection, particularly when preceded by neoadjuvant therapy. This stage of disease, termed borderline resectable pancreatic cancer, has become of increasing interest and is now the focus of a multi-institutional clinical trial. Here we outline the history, progress, current treatment recommendations, and future directions for research in borderline resectable pancreatic cancer. The concept of borderline resectable pancreatic cancer has evolved from several clinical observations made over decades. It has been recognized for some time that the prognosis for patients undergoing surgical resection for pancreatic ductal adenocarcinoma (PDAC) is highly dependent on margin status, with total gross excision and histologically negative margins (R0 resection) being associated with the best outcomes. Survival for patients who undergo total gross excision but have histologically positive margins (R1 resection) have a reduced survival in most series[3,6-9]. Most significantly, patient who undergo resection with residual gross tumor (R2 resection) have a prognosis similar to patients treated with non-operative therapy[9-12]. Historically, resectability of pancreatic cancer was defined by absence of distant metastases, absence of local tumor extension to the celiac axis and hepatic artery, as well as the lack of involvement of the superior mesenteric vasculature. However, data emerging in the 1990’s suggested that vein resection with negative margins was associated with equivalent survival to standard PD, leading to an increasing acceptance of vascular resection (VR) in curative resections. In 1994, Allema et al published a series of 20 superior mesenteric vein/portal vein ( SMV/PV) resections, showing no significant differences in survival in comparison to standard PD and confirming both the feasibility of the procedure and the capacity to obtain R0 resections with this technique. In a similarly sized study, Fuhrman et al confirmed the findings, concluding that vascular resection is a safe and effective means by which to attain complete resection in cases of tumor adherence to the SMV or SMV/PV confluence. In the ensuing years, others strengthened the notion that appropriately selected patients could undergo vascular resection to achieve survival outcomes similar to patients undergoing standard PD and superior to outcomes of locally advanced disease treated non-operatively[15,16]. In 2004, a group from MD Anderson reviewed all patients who underwent PD at their institution between 1990 and 2002 to examine the effect of vascular resection on margin status and survival in PDAC. Of 291 patients who underwent PD for PDAC, 181 had a standard PD and 110 had PD with vascular resection. Median survival was 26.5 mo in the standard PD group and 23.4 mo in the group that required VR (P = 0.18). Clearly, the extent of venous involvement has a direct relationship to operability and to final margin status. As tumors encroach on the left side of the SMV-portal vein, they encroach increasingly on the SMA. Lu et al reported that tumor involvement of greater than half the circumference was highly specific for unresectable disease. The Ishikawa classification, established by Ishikawa et al in 1992, is based on radiographic findings that demonstrate the relationship of the tumor to the SMV-PV (1) normal; (2) smooth shift without narrowing; (3) unilateral narrowing; (4) bilateral narrowing; and (5) bilateral narrowing and the presence of collateral veins (Figure 1). This classification has also been used to report the relationship between SMV-PV appearance by cross-sectional imaging and prognosis. Figure 1 Ishikawa classification of portal and/or superior mesenteric vein involvement. A: Normal; B: Smooth shift without narrowing; C: Unilateral narrowing; D: Bilateral narrowing; E: Bilateral narrowing with collateral veins. In the early 1990s a small study was conducted in which 28 patients with localized PDAC underwent treatment with preoperative chemoradiation with 5-Fluorouracil (5-FU). After restaging, 17 out of 28 were able to undergo successful resection with few complications, confirming the feasibility and safety of neoadjuvant therapy followed by resection. Similarly, a 1997 study comparing pre-operative and post-operative chemoradiation in 142 patients with resectable disease found pre-operative chemoradiation offered comparable benefits to post-operative therapy and is not hindered by post-operative complications or prolonged recovery. Pisters et al found additional advantages of neoadjuvant chemoradiation with 5-FU in 35 patients with resectable PDAC. Among 20 patients who underwent resection, median survival was 25 mo, while median survival among 15 patients who did not undergo PD was 7 mo. They concluded that neoadjuvant chemoradiation results in minimal toxicity while maximizing the number of patients who get combined modality treatment and limiting PD to those most likely to benefit. Several studies have suggested that neoadjuvant chemoradiation may enhance resectability and inhibit local recurrence[19,21]. A Phase II trial published in 1993 demonstrated a significant reduction in the incidence of positive margins and lymph nodes in tumors treated with pre-operative chemoradiation. The authors concluded that negative margin resections achieved in all 10 resected patients, and the low rate of nodal metastasis (10%) may be attributable to neoadjuvant treatment. Studies of patients with more advanced disease have also proposed that neoadjuvant therapy may result in downstaging, thereby improving the likelihood of R0 resection. In 1999 White et al performed a study of 25 patients with locally advanced pancreatic cancer treated with neoadjuvant chemoradiation at Duke University finding that only a small percent were downstaged. 22 of 25 patients underwent restaging after chemoradiation, six of 22 (27.3%) had a decrease in size of the primary tumor and three of the 22 (13.6%) had overall disease regression by radiographic imaging. White et al later reported on 111 patients with PDAC, 53 with potentially resectable and 58 with locally advanced disease who underwent neoadjuvant treatment with chemoradiation followed by restaging and surgery as deemed about 11 of 58 (19%) patients with locally advanced disease underwent resection. six of fifty-eight (11%) tumors were radiographically downstaged from locally advanced to potentially resectable by neoadjuvant. Similarly, a slightly larger study at Memorial Sloan-Kettering published in 2001 reported only 3 of 87 (3.4%) patients with locally advanced disease who received neoadjuvant therapy had significant enough responses to warrant surgical exploration. Together, these studies indicate that a small, but real population exists, in which neoadjuvant therapy appears to downstage pancreatic cancer. However, the lack of sensitivity of radiographic staging of pancreatic adenocarcinoma after chemoradiation indicates that radiographic tumor downstaging may not accurately reflect the benefit of neoadjuvant therapy. Instead, margin status and histologic response may offer more reliable evidence of the efficacy of neoadjuvant therapy. In the above-mentioned studies published by White et al in 1999, five of eight patients with either stable disease or disease regression at the time of restaging who underwent exploration were resected. One (4.5%) was resected with negative margins and negative nodes (R0). A later study by the same group reported on 103 patients with potentially resectable or locally advanced disease that underwent neoadjuvant therapy followed by re-staging computed tomography (CT). Of 49 with locally advanced tumors on restaging CT, 11 (22%), were resected, and 6 (55%) of these were resected with negative margins, suggesting that reliance on the standard CT criteria for unresectability will deprive approximately 6 of 49 or 12% of patient of the opportunity for curative (R0) resection after neoadjuvant therapy. Thus, a series of clinical observations lead to the concept of borderline resectable disease. These were well-summarized by Katz et al; (1) complete resection of the primary tumor and regional lymph nodes is mandatory for long-term survival; (2) the incidence of margin-negative resection following surgery de novo decreases with increasing involvement of the superior mesenteric vein-portal vein (SMV/PV) and superior mesenteric artery (SMA); (3) resection of the SMV/PV and hepatic artery-but not the SMA-at pancreatectomy is associated with acceptable outcomes; (4) actual tumor regression, so called, “down-staging” of locally advanced cancers is rare following the administration of conventional cytotoxic agents alone or in combination with chemoradiation therapy; and (5) chemotherapy and/or chemoradiation may be used to select patients with favorable tumor biology and physiology who may benefit from aggressive operations. In general, borderline resectable pancreatic cancer is neither clearly resectable nor clearly unresectable but rather implies a greater chance of incomplete resection in the setting of upfront surgery. Many groups have proposed definitions, however there is not yet a universally accepted definition of borderline resectable pancreatic cancer. Table 1 Comparison of radiographic differences in common definitions for borderline resectable pancreatic cancer. AHPBA/SSAT/SSO/NCCN: Americas Hepatopancreaticobiliary Association/Society for Surgery of the Alimentary Tract/Society of Surgical Oncology/National Comprehensive Cancer Network; SMV/PV: Superior mesenteric vein/portal vein; SMA: Superior mesenteric artery; HA: Hepatic artery; CA: Celiac artery. Additionally, the MD Anderson group has also described two other patient populations, termed borderline resectable “B” and “C” based on clinical, rather than anatomic criteria: those with findings that are suggestive, but not diagnostic of metastasis and patients with marginal performance status. Katz groups B and C were established to recognize clinical subgroups, in addition to the well-recognized anatomic subgroup (Katz Group A), in which staging and treatment for pancreatic cancer were unclear. Many authors acknowledge these clinical definitions, however, few have utilized Katz groups in defining study populations[32-34]. Staging and treatment in clinically defined borderline resectable disease (Groups B and C) deserves attention, however, current efforts focusing on the more widely accepted anatomic definitions have tended to take precedence. Preoperative imaging: Optimal outcomes in management of pancreatic cancer require multidisciplinary care, utilizing information from high quality imaging. CT is the most-well studied imaging modality for the evaluation of pancreatic cancer[17,29,35]. Moreover, CT is widely available and familiar to surgeons, making it an optimal imaging study for operative planning. CT should be performed using a so-called, pancreas protocol: tri-phasic contrast (non-contrast, arterial, pancreatic parenchymal, portal venous) in thin cross sectional cuts (≤ 3 mm) with multiplanar reconstructions. While CT performed in this manner has an excellent negative predictive value for unresectability, it is not as accurate at predicting resectability. This is, at least in part, due to its lack of sensitivity for identifying small hepatic and peritoneal metastases. Recently, some studies have suggested an MRI pancreas protocol may be particularly valuable due to more sensitive visualization of sub centimeter tumors/liver metastases, peritoneal carcinomatosis, and subtle signs of vascular infiltration[36,37]. The role of PET/CT in the evaluation of potentially resectable pancreatic cancer remains unclear. To date, its suggested uses include detection of metastases in high-risk patients, improved diagnostic accuracy for purposes of operative selection and assessment of response to chemoradiation[38-40]. While PET/CT may prove useful in certain circumstances, at this time, pending additional data, its routine use cannot be recommended. Tissue diagnosis: While histologic diagnosis is not required for patients with presumed pancreatic cancer who are going to be treated with upfront surgery, biopsy is required prior to initiation of neoadjuvant therapy in patients with borderline resectable pancreatic cancer. Fine needle aspiration (FNA) is the preferred method for obtaining a tissue diagnosis. While this can be performed percutaneously, under ultrasound (US) or CT guidance, endoscopic ultrasound (EUS) with FNA is favored. Numerous studies have shown that EUS-guided FNA is a safe and cost effective means of increasing diagnostic accuracy in pancreatic cancer[42-44]. Major complications are rare with approximately 2% of patients requiring post-procedure hospitalization. Additionally, EUS-FNA offers decreased potential for peritoneal seeding compared to percutaneous biopsy. In cases where EUS-FNA is not possible, other mechanisms for obtaining a tissue diagnosis may suffice. Intraductal biopsy or brushings may be collected via ERCP. This method is particularly useful in borderline resectable pancreatic cancer patients with obstructive jaundice, as these patients should be stented prior to starting neoadjuvant therapy[48,49]. Stenting these patients provides symptomatic relief, reduces risk of cholangitis, prevents coagulopathy, and normalizes LFTs - a requirement in cases where abnormal liver function might result in adverse effects on the metabolism of chemotherapeutics. In the setting of neoadjuvant therapy, expandable short metal stents are preferred as they have longer patency, and therefore are associated with a lower risk of stent occlusion and resultant complication during induction therapy[50,51]. Additionally, covered stents are associated with decreased tumor ingrowth and improved patency and are therefore preferred to uncovered stents[52,53]. Role of CA 19-9: Among many tumor antigens that have been associated with pancreatic cancer, CA 19-9 is the best validated. It is a sialylated Lewis antigen and therefore is not detectable in Lewis antigen negative individuals. Unfortunately, while relatively sensitive, its specificity is suboptimal as CA19-9 levels are often elevated in association with other pancreatic and hepatobiliary pathology, obstructive jaundice in particular. Still, preoperative CA 19-9 has been shown to correlate with pancreatic cancer staging and therefore, resectability[56,57]. Furthermore, post-resection CA 19-9 levels prior to initiation of adjuvant chemotherapy have been shown to have independent prognostic value and can be followed to indicate response to therapy[58-60]. As such, CA 19-9 levels should typically be drawn prior to surgery, following surgery prior to adjuvant therapy and during active surveillance. Staging laparoscopy: Though there is no absolute consensus on its use, numerous studies have demonstrated that staging laparoscopy can detect occult metastasis even in pancreatic cancer patients who have undergone high quality cross-sectional imaging[61,62]. Detection of occult metastatic disease such as peritoneal, capsular, or serosal implants, avoids the morbidity associated with laparotomy. In some institutions staging laparoscopy is routine, however others use it selectively in patients with high risk features for advanced disease such as significant weight loss, elevated CA19-9, and borderline resectable disease[56,64,65]. It is reasonable to consider laparoscopy before administering radiation therapy, as it is unlikely that local therapy would confer benefit to patients in the setting of metastatic disease. 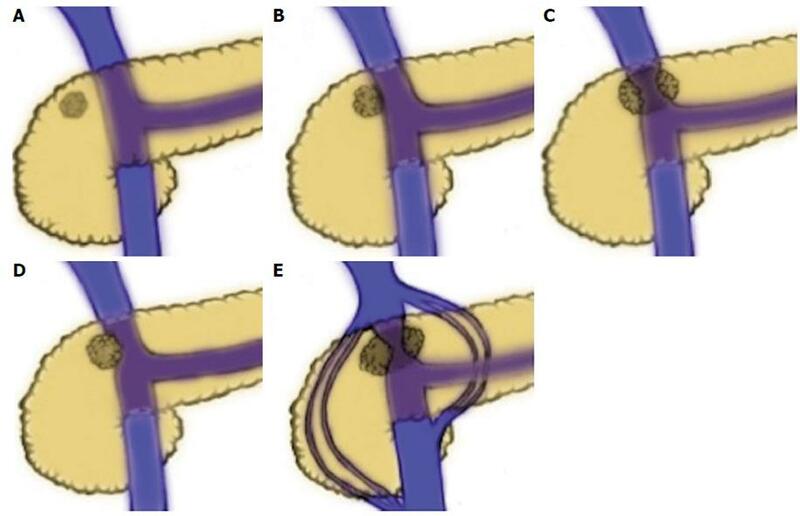 Vascular resection: The increasing safety and feasibility of aggressive surgical resections have been central to the evolution of the concept of borderline resectable pancreatic cancer. Still, vascular resection in PD remains an area of controversy. Several studies confirming similar outcomes after PD with SMV-PV resection in comparison to PD alone were crucial in the advent of borderline resectable disease[14,15,66,67]. Even so, two recent, large database studies have called these data into question. In 2012 Castleberry et al published a study using the National Surgical Quality Improvement Program database to analyze all patients undergoing PD. They found that PD with VR was associated with significantly increased morbidity and mortality. Similarly, Worni et al used the National Inpatient Sample database to show comparable increases in morbidity and mortality associated with the addition of VR to PD. These studies are subject to the criticisms of any large database study. In particular, they cannot distinguish the operations performed in which vascular resection was anticipated and planned as opposed to the vascular resection performed in the setting of vascular injury when an adherent tumor is attempted to be removed. These no doubt result in much different rates of blood loss, and morbidity. Nevertheless, these studies call attention to the continued risks associated with vascular resection and are a reminder to emphasize multidisciplinary treatment and planning prior to proceeding with surgical resection in order to reduce perioperative risk in these patients. Data with regard to arterial resection (AR) are even fewer. Some groups suggest similar morbidity and mortality in PD with AR in comparison to PD alone[71,72]. However, most studies indicate that AR significantly increases morbidity and mortality and therefore recommend this approach only for the purposes of obtaining an R0 resection. Additionally, some suggest that AR may provide improved survival in comparison to palliation alone[74-76]. Though not unanimously employed, SMV-PV resection is more widely accepted than AR. In either case, patient selection is paramount to achieving favorable outcomes. Despite a paucity of prospective data to support a standard treatment regimen for borderline resectable pancreatic cancer, neoadjuvant therapy is currently the preferred initial approach[77-79]. Theoretical advantages to neoadjuvant treatment include early treatment of micrometastasis, improved patient selection for surgical intervention, more effective treatment delivery, as well as the potential to achieve some degree of downstaging and/or increase the likelihood of R0 resection. In addition to providing the opportunity to treat early occult disease, neoadjuvant therapy ensures that patients undergoing resection receive multimodality therapy. This is an important benefit as up to 25% of patients with resectable tumors are unable to receive post-operative therapy due to post-operative complications, prolonged recovery or deconditioning. Patients with borderline resectable disease often require more complex resections and it is therefore reasonable to assume delays to receipt of adjuvant therapy may be even more significant. By identifying patients with adequate performance status to complete pre-operative chemotherapy, and tumors with more favorable biology, neoadjuvant therapy selects patients most likely to benefit from resection. In principle, pre-operative treatment may also enable enhanced tumor oxygenation and drug delivery compared to the post operative state, which may result in more effective radiotherapy. In 2001, Mehta et al described the first prospective case series of 15 patients with ‘‘marginally resectable’’ PDAC as indicated by CT evidence of portal vein, superior mesenteric vein, or artery involvement. Patients were treated with 5-FU and radiation followed by reevaluation for resection. Nine of 15 patients underwent resection, all with uninvolved margins, leading the group to conclude that chemoradiation is well tolerated, and may downstage tumors, sterilize regional lymph nodes, and improve resectability in patients with ‘‘marginally resectable’’ pancreatic cancer. Landry et al reported the first multi-institutional prospective study in borderline resectable PDAC, a randomized phase II trial comparing neoadjuvant regimens. From 2003 to 2005, 21 patients were identified at 10 Eastern Cooperative Oncology Groups institutions. In Arm A, 10 patients, received gemcitabine based chemoradiation, in Arm B 11 patients received induction chemotherapy using gemcitabine/cisplatin/5-FU followed by chemoradiation with 5-FU. 3 patients in Arm A and 2 patients in Arm B were resected. The median survival of resected patients was 26.3 mo. All patients received adjuvant gemcitabine for 5 cycles. The trial was terminated early due to poor accrual, however it found both neoadjuvant regimens to be tolerable, with similar resectability and survival to those reported in retrospective studies. Aside from these prospective trials, the literature in borderline resectable pancreatic cancer consists mainly of retrospective single institution studies (Table 2). Table 2 Largest studies in borderline resectable pancreatic cancer. 2Results for patients who received neoadjuvant treatment. NR: Not reported. The first report from MD Ander Cancer Center was a, retrospective review of 160 patients, divided into 3 groups defined by both anatomic and non-anatomic variables. Among these included 84 patients with anatomically defined borderline resectable tumors. Patients were treated with a variety of neoadjuvant regimens incorporating chemotherapy, chemoradiation, or both, prior to planned resection. Of this group, 38% underwent resection - 97% of which were R0. The median survival of all patients was 21 mo: 40 mo for resected patients and 15 mo for patients who did not undergo resection. Since this study, multiple smaller and few similarly sized retrospective reviews have reported similar findings. Small et al first used the NCCN definition of borderline resectable disease in a multi center, phase II trial of lesser degree, enrolling 41 patients, including 9 with borderline resectable disease. The study used neoadjuvant full dose gemcitabine plus radiation therapy, and found that treatment was well tolerated and that 33% of were able to proceed with resection. They observed a 76% one-year survival rates, and concluded that the strategy should be further explored. Numerous other small-scale studies demonstrate the safety and efficacy of other neoadjuvant regimens. Stokes et al performed a retrospective review of 170 cases of PDAC and identified 40 cases of borderline resectable pancreatic cancer according to the M.D. Anderson definition (A: 30; B: 5; C: 5). These patients underwent accelerated chronomodulated capecitabine-based chemoradiation using stereotactic-based radiotherapy. About 34 of 40 (85%) borderline resectable patients completed neoadjuvant therapy and were restaged, 16 (46%) of these underwent successful resection. R0 resection rate among these patients was 75%. The group concluded that accelerated chronomodulated capecitabine-based chemoradiation with stereotactic-based radiotherapy was an efficient and well-tolerated treatment. Most recently, Chuong et al performed a retrospective review of 73 patients who were treated with induction chemotherapy with Gemzar, Taxotere, and Xeloda and stereotactic body radiation therapy at H. Lee Moffitt Cancer Center. This included 57 patients with borderline resectable disease as designated by the NCCN definition. Among 32 borderline resectable patients who underwent resection, only one patient (3.1%) had an R1 resection, while 31 patients (96.9%) had R0 resections, and median overall survival was 20 mo. It is clear that across studies, approximately one third of patients can go on to successful resection, however, small study size, inconsistent definitions of disease and a multitude of neoadjuvant strategies make it impossible to draw other definitive conclusions from these studies. The same constraints have also made it difficult to establish anatomic guidelines for decision-making. The Fox Chase group performed a retrospective review of 109 patients with PDAC involving the PV/SMV in an effort to better delineate the degree of involvement of the PV/SMV that best defines the group of patients who would benefit from neoadjuvant therapy and resection (borderline disease). The patients were grouped according to Ishikawa classification with types II and III equating to unilateral involvement in 67 patients, while types IV and V were used to describe bilateral involvement in 42 patients. Pre-operative chemotherapy improved resection rates and overall survival in Ishikawa types II and III (unilateral involvement), but not types IV and V (bilateral involvement). R0 resection rates in the neoadjuvant and primary resection groups were 71% and 5%, respectively (P = 0.0001) for types II and III, but 41% and 23%, respectively (P = 0.25) for types IV and V. Similarly, median overall survival rates with and without neoadjuvant were 26 and 10 mo, respectively (P = 0.0001) Ishikawa type IV and V patients, were 21 and 22 mo, respectively (P = 0.48). While this study supports the benefit of neoadjuvant therapy in patients with Ishikawa type II and III vs in types IV and V, increased median overall survival in patients who underwent primary resection with types IV and V (22 mo) in comparison to types II and III (10 mo) highlight the difficulty in drawing accurate conclusions due to small study size. More recently, Katz et al applied Response Evaluation Criteria in Solid Tumors (RECIST) criteria to determine the effect of neoadjuvant therapy on anatomic extent and size reduction in borderline resectable PDAC. They reported on 129 patients with borderline resectable tumors who underwent neoadjuvant treatment at MD Anderson. 122 of them were restaged and of these, only 15 (12%) showed partial response by RECIST criteria. Despite this, 85 (69%) underwent resection, 81 (95%) were R0. Median overall survival of those who underwent resection was 33 mo, which did not correlate with RECIST response indicating that a lack of radiographic evidence of tumor response in PDAC is of little clinical value as prognostic or predictive marker. The authors therefore suggest aggressive surgical resection in patients with adequate performance status and absence of disease progression. Like the United States, Asia and Europe have tended toward increasingly aggressive treatment of borderline resectable pancreatic cancer. Europeans have focused on chemotherapy rather than radiation therapy, seeking improved neoadjuvant and adjuvant regimens to control systemic disease-as this is the most common cause of treatment failure[11,88-92]. Asian countries have also employed neoadjuvant strategies, but with increased emphasis on determining how it effects surgical resection[93-96]. Additionally, they have focused on defining radiographic criteria to predict surgical outcomes as well as surgical aspect that influence outcomes, such as likelihood of R0 resection, and need for vascular resection[97-100]. The lack of uniformity in the definition of borderline resectable PDAC has been an obstacle to evaluating the optimal preoperative assessment, therapeutic strategy and surgical decision-making regarding this group of patients. In recognition of a growing national interest in serving patients with borderline resectable PDAC, and to establish an infrastructure in which to acquire data through multi-institutional trials, The Alliance for Clinical Trials in Oncology (Alliance), in cooperation with the Southwest Oncology Group, Eastern Cooperative Oncology Group, and Radiation Therapy Oncology Group, has received support by the NCI to conduct a multi-institutional treatment trial for patients with borderline resectable PDAC (Alliance A021101). This trial was designed as a single arm pilot study with the intent to utilize a standard objective definition based on cross-sectional imaging, and to determine if a there was a sufficient patient population to conduct cooperative group trials. The study design employs a neoadjuvant design with induction chemotherapy and chemoradiation therapy, surgery and adjuvant chemotherapy[26,84]. With an aim to establish a clear, reproducible means by which to define borderline resectable PDAC by radiologic criteria, the trial has recognized any one or more of the following identifiers of borderline resectable PDAC: (1) interface exists between tumor and the SMV/portal vein measuring 180 degrees or greater of the vessel wall circumference, and/or reconstructable venous occlusion; (2) interface exists between tumor and the SMA measuring less than 180 degrees of the vessel wall circumference; (3) a reconstructable, short-segment interface of any degree exists between tumor and the common hepatic artery; and/or (4) interface exists between tumor and the celiac trunk measuring less than 180 degrees of the vessel wall circumference. Using this definition, the trial will evaluate the survival, outcomes and toxicity rates using 4 cycles of mFOLFIRINOX (oxaliplatin 85 mg/m2, irinotecan 180 mg/m2, leucovorin 400 mg/m2, 5-fluorouracil 2400 mg/m2) followed by external beam radiation therapy (50.4 Gy) with capecitabine (825 mg/m2). After re-staging, patients who are deemed candidates for resection proceed with surgery followed by post-operative gemcitabine. The use of modified FOLFIRINOX (mFOLFIRINOX) as induction therapy in the Alliance Trial is based on the superior survival and response rates observed for FOLFIRINOX in metastatic pancreatic cancer in a randomized controlled trial of 342 patients with metastatic pancreas cancer. The dosing was modified in an attempt to partially circumvent the greater toxicity associated with FOLFIRINOX in comparison to gemcitabine. While FOLFIRINOX displayed improved median overall survival (11.1 mo vs 6.8 mo, P < 0.001), median progression-free survival (6.4 mo vs 3.3 mo, P < 0.001) and objective response (31.6% vs 9.4%, P < 0.001), toxicities including neutropenia, febrile neutropenia, fatigue, vomiting and diarrhea were all worse with FOLFIRINOX. The Alliance Trial is therefore utilizing a modified regimen, or mFOLFIRINOX, in which the 5-FU bolus has been dropped, but all other dosing remains the same, in an effort to reduce these toxicities. After resection, borderline resectable pancreatic caner is treated similar to any other resected PDAC. Consequently, adjuvant chemotherapy in this trial is administered according to the standard gemcitabine regimen used following resection of PDAC. This benchmark trial will assess the feasibility of multi-institutional efforts to study the subset of patients regarded as having borderline resectable disease and establish a foundation for future studies in this group of patients. While the primary endpoint of the study is, in fact, accrual, it will be of great interest to assess the activity of the neoadjuvant regimen by secondary endpoints such as the number of patients who undergo negative margin resection and overall survival. As of December 14, 2013, 14 of a targeted 20 patients had been accrued, suggesting a promising outcome for this trial. Borderline resectable pancreatic cancer has become recognized as a clinical entity worthy of study based on a number of clinical observations that recognize a continuum between resectable and locally advanced unresectable disease. There are few prospective trials and therefore no data to support a specific neoadjuvant therapy regimen in borderline resectable PDAC. However, numerous studies suggest that patients with borderline resectable PDAC who receive neoadjuvant therapy can go on to R0 resection and enjoy outcomes similar to disease that is originally resectable[81,88,103]. Taken together the available data suggests that approximately one-third of initially borderline resectable pancreatic tumors may be proceed successful resection following receipt of neoadjuvant therapy. Difficulties in achieving a consensus, objective definition, small numbers of patients and variability in therapeutic algorithms have delayed progress in establishing strong evidence-based practices for diagnosis and treatment. The Alliance trial represents a first step in establishing reproducible standards by which future trials in borderline resectable PDAC can abide. Special thanks to Sam Prendergast for his efforts in illustration.